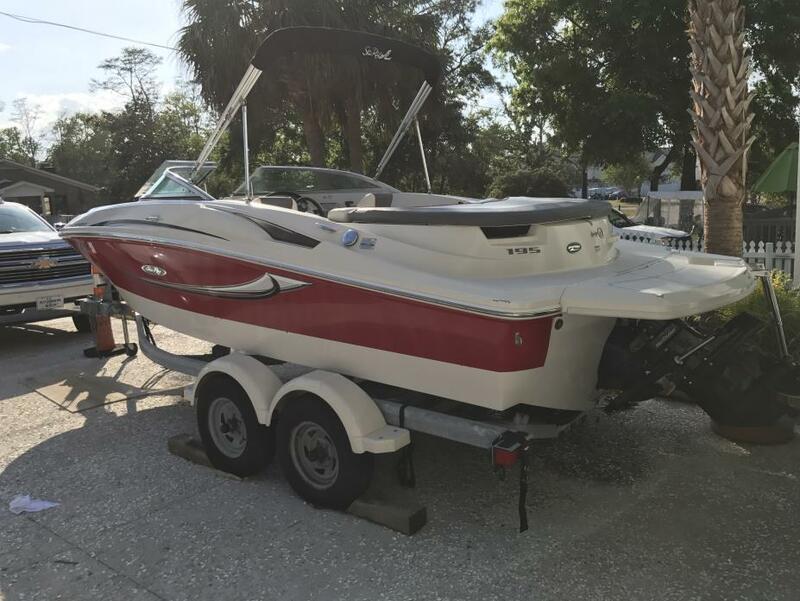 2006 Sea Ray Sport 195 is in way better condition than expected. Less than 220 original hours. Boat, motor & trailer are clean. No tears in upholstery, Carpets are clean. Engine & drive recently serviced. Seller reports ALL systems in great working order. 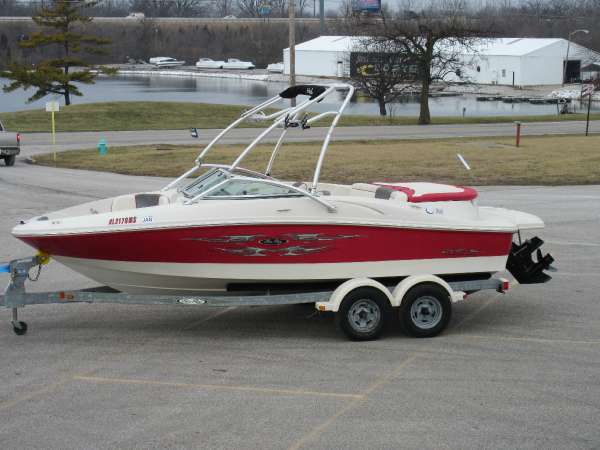 Stock #171530 Set up as a wakeboard boat with tower and Bimini. 5.0 Mercruiser V8 engine. 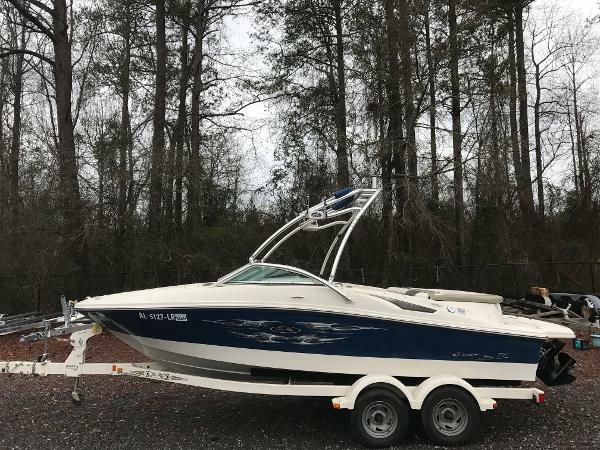 If you are in the market for a bowrider, look no further than this 2006 Sea Ray 195 Sport, just reduced to $17,450 (offers encouraged). 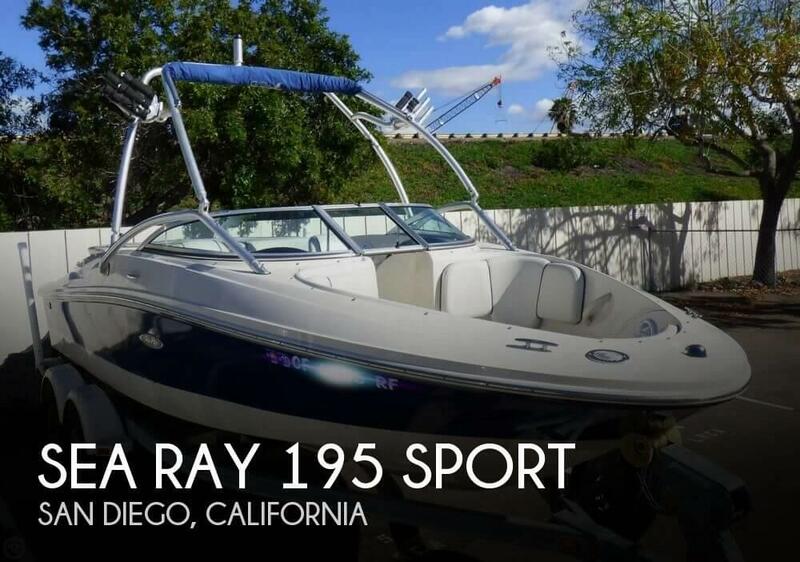 This boat is located in San Diego, California and is in great condition. 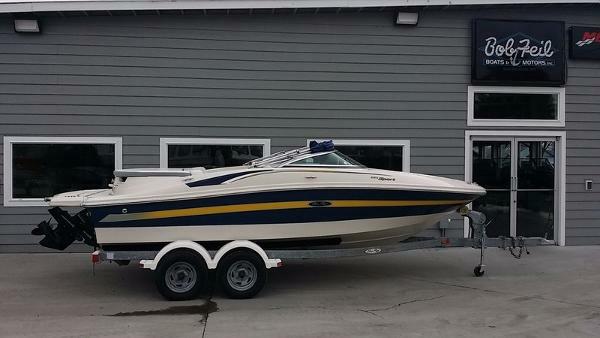 She is also equipped with a Mercruiser engine that has only 219 hours. 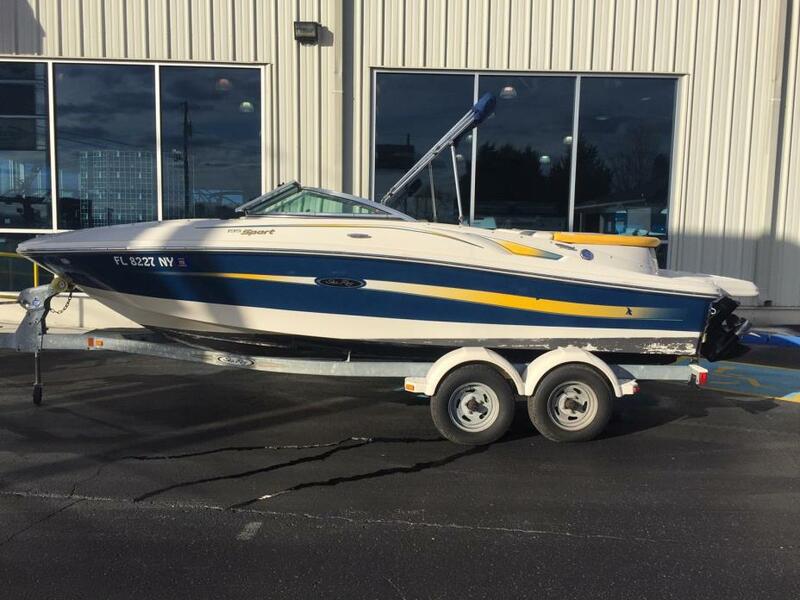 Reason for selling is moving out of town ~ no time to use..
2006 Sea Ray 195 Sport Available in a variety of dynamic new colors, this spirited 195 Sport includes the innovative Turn-Key Starting (TKS) system, standard extended swim platform, full sun pad, and ski and wakeboard storage with heavy-duty vinyl matting. A custom-fitted tandem axle trailer comes standard, complete with surge brakes and swing-away tongue. 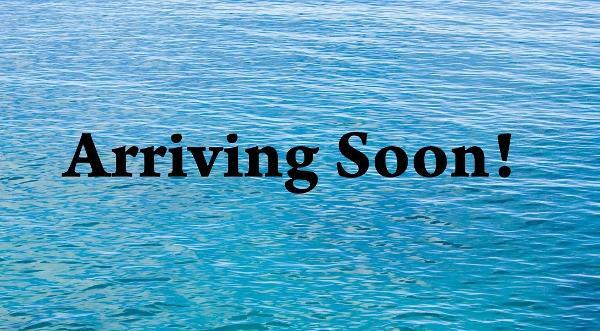 2006 Sea Ray 195 Sport This Is A 2006 Sea Ray 195 Sport, Equipped With A Mercruiser 4.3 MPI Alpha-1, I/O, 220Hp. 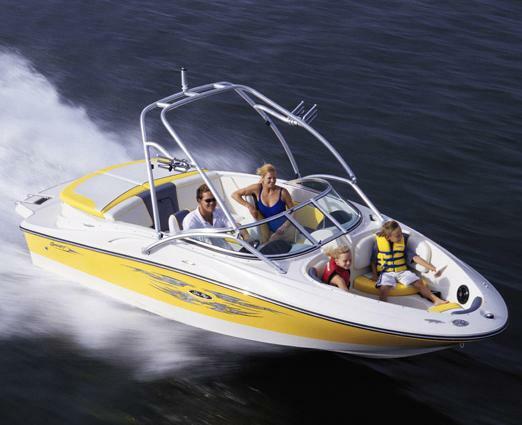 Includes Am/Fm CD Player, Tilt Wheel, Trim Indicator, Fuel Injection, Glovebox, Bow Cover, Cockpit Cover, Ski Locker, Aft Ski tow Ring, And Swim Step With Fold Down Ladder. Seats 8, Driver And Passenger Bucket Seats, Bow Seating With Storage, Aft Bench Seating With Sunpad. Trailer Is A RoadRunner, Painted Black, Tandem Axle With Custom Wheels. Trades Welcome. Come On In To Make A Deal! WAS Priced At $22,500 WITH THE EXTRA 10% DISCOUNT IT IS NOW ONLY $20,250!!! HURRY IN BEFORE THIS DEAL ENDS!! 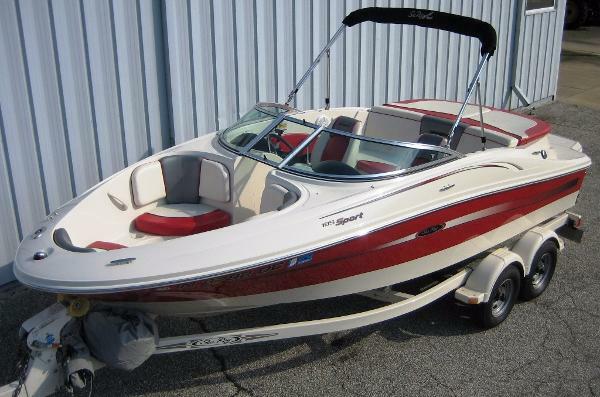 2007 Sea Ray 195 SPORT, This awesome Sea Ray 195 Sport is powered by a Mercruiser 4.3L V-6. It is a 100% fresh water boat and has only 165 hours. The interior is in great condition as well as the gel coat. There are minor cracks at the base of the windshield, which is normal for this year, make and model. The hull has a coat of bottom paint. This boat is in great shape mechanically, all of the gauges, navigation lights, bilge pump and blower are in proper working condition and ready for the water. Additional equipment includes bimini top, bow and cockpit tonneau covers, depth gauge, stereo and a tandem axle trailer with all new tires. 2008 Sea Ray 195 Sport The 195 Sport is sleek, fast and good looking, with seating for everyone. 2006 Sea Ray 195 Sport, This is a very clean and nice 2006 Sea Ray 195 Sport powered by a Mercruiser 5.0L V-8 220hp with 110 freshwater only hours. This boat comes with a full mooring cover, Bimini top, extended swim platform, snap in carpet, flip up bolster seats, depthfinder, stereo, large rear sunpad stainless steel prop, swim ladder and more. It includes a tandem axle galvanized trailer. $19,995.00 or finance for $179.00 per month W.A.C. 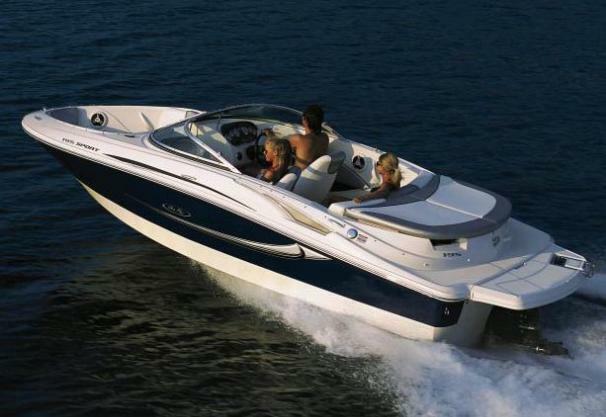 For more information on this 2006 Sea Ray or over 100 boats in stock call or email American Boat Brokers today! 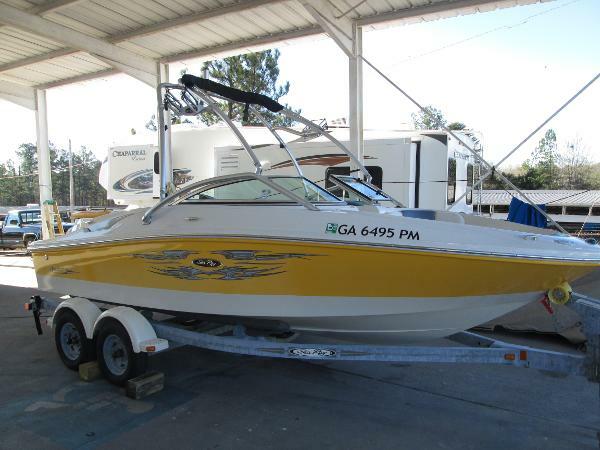 2007 Sea Ray 195 Sport, Great boat for a family looking to get out and have some fun! The tower allows for easy towing! 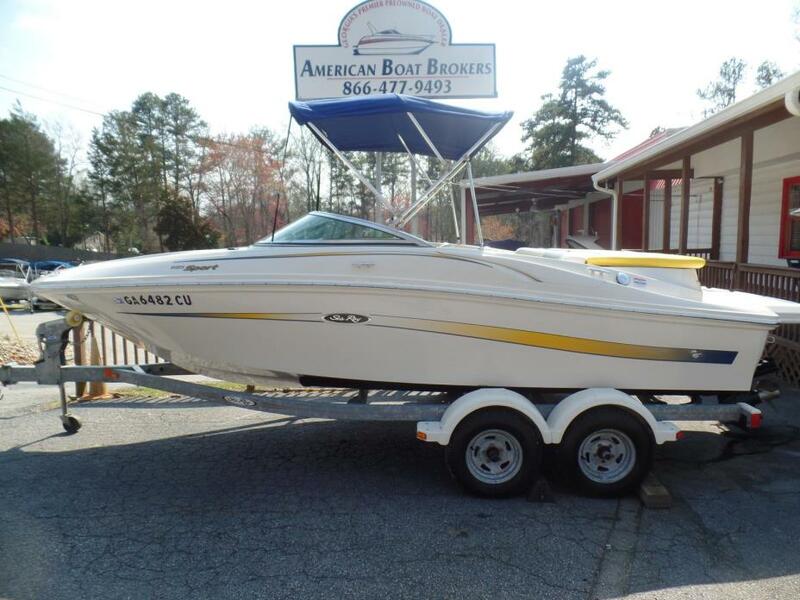 Boat is priced with a trailer! 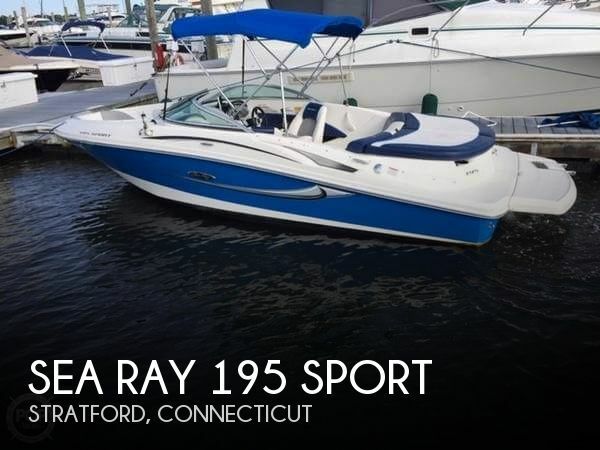 2008 Sea Ray 195 Sport 2008 Sea Ray 195 Sport 2008 Sea Ray Sport 195 in excellent conditions with only 43 Hours on this 5.0 Liter Mercruiser inboard (220 H.P.) 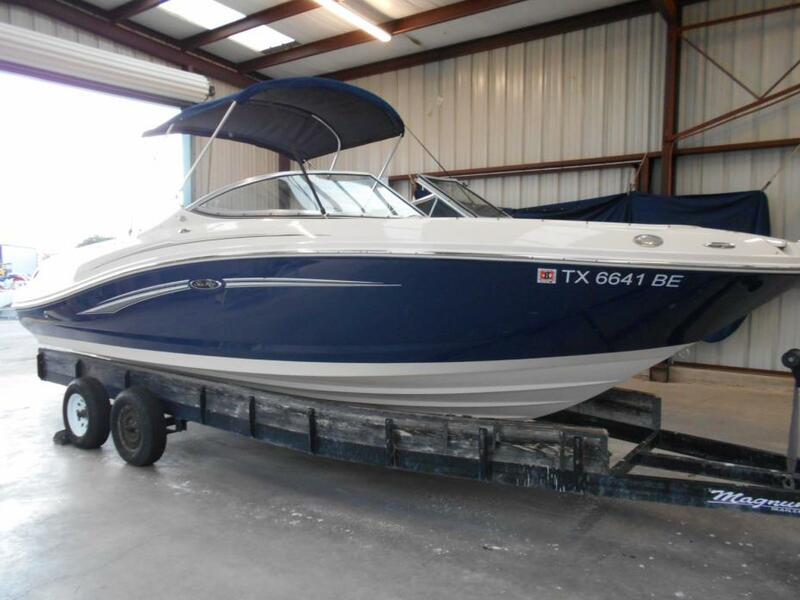 Also includes Upgraded stereo, fiberglass swim platform extension, full fiberglass liner flooring, Bimini shade top, Tandem axle galvanized trailer with brakes, digital depth finder, trailer swing togue & Full boat cover. 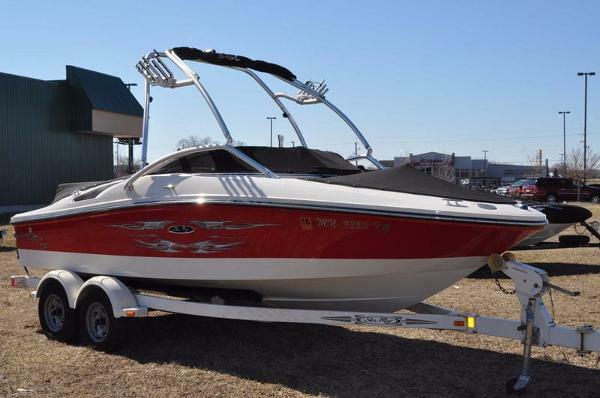 2007 Sea Ray 195 Sport Available in a variety of dynamic colors, this spirited 195 Sport includes the innovative Turn-Key Starting (TKS) system, standard extended swim platform, full sun pad, and ski and wakeboard storage with heavy-duty vinyl matting. A custom-fitted tandem axle trailer comes standard, complete with surge brakes and swing-away tongue. One owner always kept on lift, 170 hrs, yearly serviced, ready to go and enjoy.